Bhima or Bhimarathi River Pushkaram is held once in 12 years and is conducted in Bhima River banks in Maharashtra, Karnataka and Telangana through which Bhima River flows. Bhima River Pushkaram 2018 dates are from October 12. This pushkaram is held when Jupiter enters Dhanu Rasi (Sagittarius). The main ritual includes taking holy dip in the Bhimarathi River River. Note - The Bhima Pushkaram in some texts is also refered as Tamraparni. Tamraparni River flows in Tamil Nadu. There is a river of the same name in Chandgad Taluka in Kolhapur District of Maharashtra. A Pushakaram takes place once in 12 years when Jupitar (Brishaspati) enters a particular zodiac. There are total of 12 rivers where Pushkaram takes place. The most famous is the Godavari Pushkaram. The ritual of pushkaram is more popular in Telangana and Andhra Pradesh. What do Hindus do during Bhimarathi Pushkaram? During Bhimarathi Pushkaram, Hindus take holy dip in Bhima River at the auspicious time decided by Mutt heads, temple priests and panchangs. It is believed that the holy dip helps in sin redemption, curing of diseases and moksha or liberation. Bhima, or Bhimarathi River, originates at Ambegaon near Bhimashankar Temple in the Bhimashankar hills (Khed Taluka in Pune District, Maharashtra). It flows southeast for 861 kilometers through Maharashtra, Karnataka, and Telangana states, before entering the Krishna River. Bhima River merges with Krishna River on the border of Karnataka and Telangana. The spot is around 24 km from Raichur. Bhimashankar, one of 12 Jyotirlinga temples, is located on the banks of Bhima River. Another famous temple is the Pandharpur Vittal Temple. Bhima is regarded as Maharashtra's holiest river as its banks house the temple town of Pandharpur. 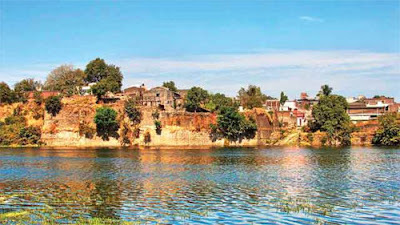 Bhima is known as Chandrabhaga at Pandharpur due to its crescent shape and lakhs of warkaris (devotees of Pandarpur's Lord Vithoba) take a dip in the waters.